No, not that kind, the chocolate shortbread kind. You roll a small ball of dough, shape it like the body of a teeny tiny mouse, pinch out two teeny tiny ears on each side, place two teeny tiny miniature chocolate chips for eyes, bake them, remove them from the oven and carefully insert teeny tiny strings of licorice for tails. And then you lose your teeny tiny mind. I’ve made them for years. Then, a few years ago, someone said she never really cared for them. That was essentially a declaration of war in my book, but I got over it because we are related by blood. I quit making the mice. Hey, the mice and I don’t need a rat trap to know when we’re not wanted. This morning I had an email asking if I would be making the mice. It was from one of the kids (and yes, she’s my favorite right now) who enjoyed the mice and wants her little ones to enjoy them, too. 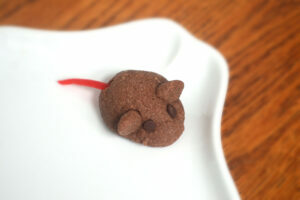 I hereby sanction the chocolate mice as official family tradition. It has occurred to me that many family traditions are born of accident as much as they are of intentionality. The one unnegotiable tradition of Thanksgiving is the turkey because it was what the pilgrims ate. Of course, they had fish, too. Fish and fowl. Some holidays, when I’m wrestling the big bird, I dream of whipping up to the corner Fish and Chicken and returning with a big bucket—fish and fowl, just like the Pilgrims. The gesture would not be warmly received, so I continue a second round with the big bird. A friend had a tradition of making Sloppy Joes every Halloween using a recipe her mother had used. There’s no tie between Sloppy Joes and Halloween, but it was a tradition that became part of their family. My mother-in-law had a holiday tradition of making sweet potatoes in her electric skillet. A stick of butter, mountains of brown sugar—it was decadent. And delicious. I would continue her tradition, but who has an electric skillet? I suppose that’s my fault. I let the tradition slip. Family traditions are reminders of who we are, the tables we came from and ties to those who have gone before. I’m suddenly hungry for Waldorf salad.